Director and dramatist Theresa Heskins adds her version of Dickens’s classic tale to the countless others that have gone before it. The story is so well-known there can be few who attend this production who have not already come across it in one form or another. Amazingly, this is not a drawback. You might think this is a matter of the telling rather than the tale, the way the story is told rather than the actual, familiar material, but both form and content are powerfully represented in this magical and affecting production. As the New Vic’s resident artistic director, Heskins is in her element working in-the-round. She has adapted the story into a piece of narrative theatre, with cast members sharing the scene-setting descriptions, but she also uses those actors to supplement the scenery as physical objects themselves. This is stylish and fun, to be sure, but the approach also works as a metaphor for the way Ebenezer Scrooge treats people as objects, of his renouncement of their humanity. 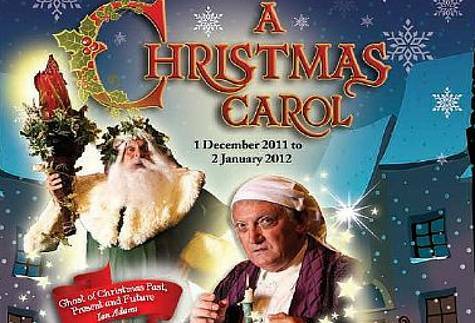 The stage is kept busy with beggars, carol singers, revellers, children and all the rest of them, come and go, but the centre of attention is Paul Greenwood’s layered performance as Scrooge, the bitter, sarcastic curmudgeon who is reminded of his own humanity through memory and prophecy. When Jacob Marley steps up to where the door knocker is, it is Greenwood’s reaction that makes it work. We share his delight when he watches his nephew and guests enjoy parlour games. We feel his joy at waking up and realising he hasn’t missed Christmas Day… He is the focus of this production, reminding us that there is more to Scrooge than the stereotypical Grinch-like image. The entire cast is a slick and well-rehearsed engine. Hannah Edwards makes a cheery and fresh-faced Ghost of Christmas Past, playfully taking Scrooge back to his childhood days in scenes I always find moving. Antony Jardine’s Ghost of Christmas Present is infectiously merry, in a larger-than-life laughing-out-loud performance that proves you don’t need to be padded up in order to represent ho-ho-ho jollity and good cheer. The Ghosts of Christmas Yet To Come are a trio of eerie skeletal wraiths – the show uses puppetry sparingly but effectively; Tiny Tim is a little wooden boy, delicate and vulnerable, but denied any chance of mawkishness and sentimentality. Bryn Holding as Nephew Fred has a hoot of a laugh that effuses bonhomie. 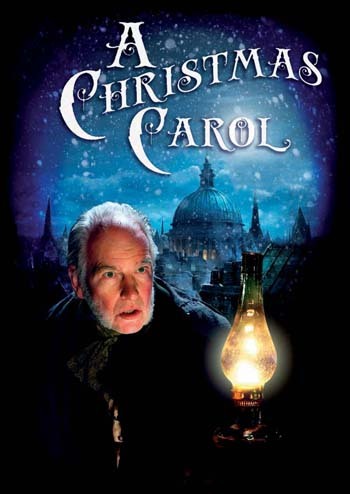 Mark Donald appears as Young Scrooge, hardening his heart against the one girl that loves him – the error of Scrooge’s ways could not be made clearer. There is the imagery of being caught up in a web of his own creation, just as Marley is enchained by the selfishness he perpetrated in life. The folly of preferring money to people is all too prevalent in our day and age. Benevolence is not just for Christmas. This is a magical, inventive production that allows the original story to have its impact all over again. I was in tears before the interval and infused with a rosy glow long after I left the auditorium. It is well worth the trip to Staffordshire. I hope more people will make the trip and enjoy the ride.